Truth. Encouragement. Laughter. The stuff every woman needs. Here's some info on sheep. If the flock is neglected or not managed well, the sheep can be quite destructive to the landscape. They will overgraze and ravage the land almost beyond repair. However, under careful supervision and guidance, they can be the most beneficial of all livestock to the land they pasture. One commentary about sheep says that ancient literature refers to them as "the golden hooves" because of the benefits to the soil from their manure. Sheep rid their grazing lands of all sorts of undesirable plants, herbage that would otherwise ruin the landscape. When the shepherd leads the flock to high pasture for resting, the fertility from the rich low lands is deposited on these less productive grounds. A flock of sheep under the care of a wise shepherd can clean up and restore pasture lands as no other livestock can. One shepherd writes that " I have, in just a few years, seen two derelict ranches restored to high productivity and usefulness. More than this, what before appeared as depressing eyesores became beautiful, park-like properties of immense worth." Sounds like goodness and mercy followed those flocks. The places they grazed were better because the sheep had been there, more productive, more beautiful, more beneficial. Can this be part of the meaning the psalmist has for us? Surely we have all witnessed (or perhaps participated in) scenarios where Christians leave behind shipwrecks more than a restored field. We can recall all too vividly being hurt or wronged by fellow believers. We have all seen the damage done by a critical spirit or a gossipy tongue or a vengeful heart. Probably we've all done some damage inflicting ourselves. But I think that maybe, just maybe, the point of verse 6 is a plea, a call, a prayer that "surely" this won't be true for us. "Surely" we will be those who leave behind us things better than when we arrived. Numerous examples of this truth come to mind. I think about some college kids I know who have built authentic relationships with scores of homeless folks, faithfully loving on them, ministering to more than just their physical needs. I think about a relative of mine who consistently invests herself in folks who need some help in all sorts of ways. About a friend of mine who brightens up a room when she walks in, leaving a trail of encouragement and cheerfulness. About a few men who addressed the medical needs of the poor in our community...and a free Christian medical clinic named Mercy Health Center followed. About a young woman at my church who responded to a crisis in her own family by birthing a ministry of compassion to others who face similar situations - Bryan's Blankies. About a missionary friend who plants seeds of grace and truth in my heart every time I have the blessing to speak with her. About a Mom and Dad who always give me the benefit of the doubt, especially when I don't deserve it. About the patience and kindness of a husband who always believes the best about me...and everyone else. Even in the face of mounting evidence to the contrary! May the desire of our hearts be that goodness and mercy will be the trail that we leave. May our lives be so lived that the places we travel will be better off because we stopped by. May those that watch us learn about the goodness and mercy of our shepherd...through the fragrance of our lives. And then, we will surely dwell in the house of the Lord....of our Shepherd...forever. Because of His mercy, goodness will be ours. Unendingly. Abundantly. Amen. Thanks for joining me in learning about Psalm 23. From one sheep to another. 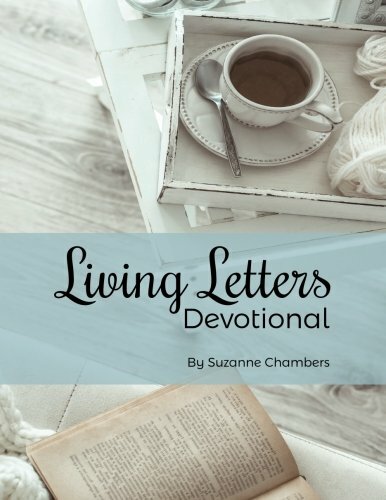 Welcome, Here is my collection of Living Letters, a dose of encouragement for you. Please Subscribe below and make sure to check out my devotional book, available on Amazon. Thank you for subscribing to my Living Letters blog- Have a blessed day! Personal accountability, stop the sinning...what else can we do to keep ourselves in a place of JOY? It's the biggest day on the calendar for the Christian. But today I am not thinking about Sunday. Thank you for subscribing to my Living Letters blog. Have a blessed day!